Suzanne Lane and Scott Harrison. Photo provided by Adventure Theatre, MTC. Nick Olcott returns to ATMTC to direct “Knuffle Bunny: A Cautionary Musical,” a delightful musical based on the children’s book by Mo Willems. Willems wrote the book and lyrics while Michael Silversher composed the upbeat and memorable score. The story follows Trixie, a young girl who is not yet verbal, and her stuffed Knuffle Bunny as they go on an adventure to the laundromat with her dad. Mom is going to the spa and it is dad’s first time with Trixie on his own. It isn’t perfect. Things go wrong. But it turns into a beautifully heartwarming story about family. It is funny and touching and just plain sweet. This is truly a show that the whole family will enjoy. Any parent who has ever questioned their competence will relate to Mom and Dad. Scott Harrison played Dad with the utter charm and gawkiness of a father who just wants to do right by his daughter. Harrison is a very high energy actor with a singing voice that soars beautifully. He paired well with Emily Zickler’s portrayal of Mom. She has a gentle maternal demeanor and a warm smile. Trixie was played by Suzanne Lane who played Spider in ATMTC’s production of “James and the Giant Peach” last season. Lane’s fantastic physicality and goofy gibberish syllables made her an endearing and charming little girl. Her clown like fascination with a pigeon and fear of a fire truck were heartwarming. She sings a charming ballad and although she is not using real words, the emotion that she is experiencing was portrayed so clearly. The cast was rounded out with John Sygar and Simone Lewis who played a variety of characters and puppets, designed by Andrea “Dre” Moore. Their range of skills was remarkable and their quick changes were truly magical. One of the funniest moments, for adults and kids alike, was when Harrison battled a giant pink bra puppet, controlled by Sygar. Those quick change costumes were designed by Robert Croghan. The use of color and pattern to distinguish the characters was a great tool, especially for the audience members with little eyes. The large set had some rotating pieces between the house, street, and laundromat. Designer Douglas Clarke made a set simple enough for the little audience members to understand without making it terribly bland to look at. The variation in texture and color and the great height of the set made it very aesthetically pleasing. ATMTC Artistic Director Michael J. Bobbit choreographed the musical with some technically complex dances. One of the most memorable was in the laundromat with laundry baskets. It was such a fun and colorful number. Another great moment was when Dad jumped into the washing machine and the theatre filled with bubbles as he battled the laundry to save Knuffle Bunny. This show is a lovely little piece of theatre that the young audience members will find engaging and the adults will find amusing. It is funny and touching and just plain sweet. It shows that even doing the laundry can turn into a great adventure. 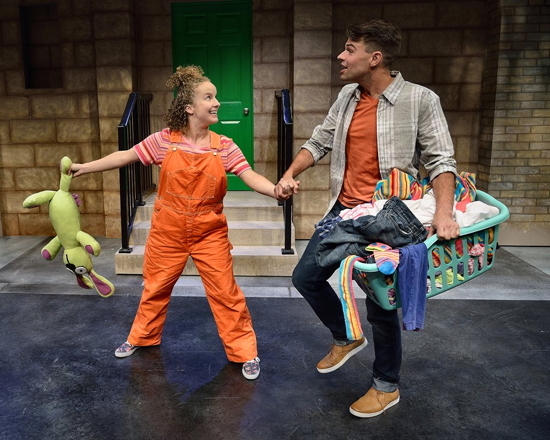 “Knuffle Bunny: A Cautionary Musical” runs at Adventure Theatre MTC through October 23. For more information and tickets click here.